This spring’s Special Students had the opportunity to network and learn about applying to graduate school from a panel of MIT grad students. 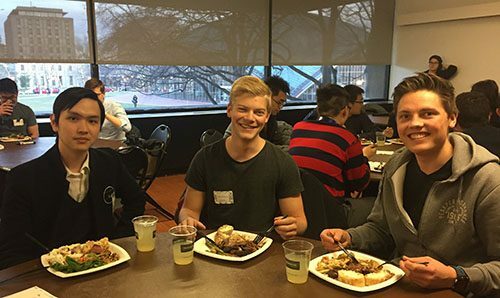 The Office of the First Year and Office of Graduate Education offered an exciting opportunity for this spring’s Special Students to reunite over dinner on May. The undergraduates, who are from other schools/universities, have been spending their semester taking classes at MIT. The dinner event offered the 45 guests a networking platform with peers, as well as insights about the graduate school application process from a panel of MIT graduate students: Kelly Gaus (Philosophy), Erica Tsai (Chemistry), Marek Hempel (Electrical Engineering), Jonathan Lovett (Sloan Management), and Christine Chen (EAPS). Panelists enthusiastically shared their perspective on the factors that they considered important when looking at graduate schools. How did they know if a particular school was good fit for them? How did they strengthen their applications? What are graduate schools really looking for in candidates? What research environment would help them become a better researcher? The graduate students believe that faculty are one of the most essential pieces to consider when researching whether schools are a good fit for them. A good match with the faculty with whom they would be working will strengthen their ability to assimilate into a university’s department. Applicants should also consider what projects and programs are offered. By visiting the universities, they can ask faculty and other graduate students for answers to these questions. The panel shared advice on how students can strengthen their applications once they have narrowed down their choices. They suggested including a lot of detail about one’s interests and what they will bring to the school in their personal statement, because that’s the applicant’s chance to share their passions. The GPA, GRE, personal statement, and references are considered separate from one another, and their importance depends on the specific program; for example, in some cases, how an undergraduate performs in their classes has no correlation with how they will perform in a lab. Finally, the panelists said that references are crucial because the fields of study are usually small, so strong references from reputable sources speak to one’s character and ability.